Buy Ticket to Ride and PriceWatch, Buy this board game at the Lowest Price. 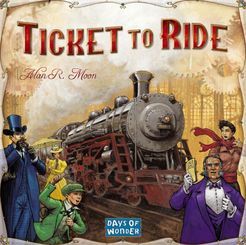 Ticket to Ride is a strategy board game by designer Alan R. Moon and is based on the railway theme. It was published in 2004 and won the Spiel des Jahres and Origins awards the same year. The game has an engaging theme and gameplay, and has an elegant simplicity. This has made it very popular and easy for players to pick up. It is considered one of the best 'gateway' games to introduce new players to the world of strategy board games, introducing key strategy concepts while keeping the gameplay and rules very simple. The industrial age is upon us and the time is ripe to show the world who is the greatest railroad baron in Ticket To Ride, the rail-building strategy board game. Use your resources and locomotives to connect the many cities on the map and build the greatest railway empire in the country. Build extensive and exclusive networks and fulfil city connection contracts before the other players. Strive to become the top dog in the industry and defeat the competition! The premise of Ticket to Ride is pretty straightforward: a bunch of railroad barons are racing to connect the many cities in the country by rail, and the winner is the player who creates the greatest rail network. How well you do is measured in victory points, which you earn by building individual city-to-city rail lines, by completing specific cross-country connections, and by fulfilling other goals (depending on which version and/or expansion of the game you are playing). In the game, each city on the map is connected to at least one other city via one or more potential rail lines. These lines represent where you can build your railway, and range from a short 1-track to a long 6-track line. These lines also have a color code, which determine which specific types of rail can be built on it. There are 8 line colors representing 8 different rail types, and gray lines which allow any rail type to be built on it. Once a player builds a railway on a line, no other player can do so. So how do you build your railway tracks? The tracks are represented by colored cards that you play from hand. Cards are taken from the deck, of which a handful of them are visible for you to choose. During your turn, you can take cards from either the visible ones or randomly from the top of the deck, or you can use the cards to build a rail connection. Building a connection is essentially a color-matching exercise. You will need to match the color and length of a rail line with cards in your hand in order to build on that line. This means you will need to discard 5 blue cards from your hand in order to build it. There are also powerful wildcard cards that can be used to represent any color. Building tracks will earn you victory points in 2 ways. The moment you place a new railway linking 2 cities, you earn points based on the length of the line. Longer lines are rewarded more: you earn 2 points for a 2-track line, 7 points for a 4-track line, and a whopping 15 points for a 6-track line. This system encourages you to collect large sets of cards of the same color in order to build longer and more rewarding tracks. The second way of earning points is via fulfilling city connections on destination cards. At the start of the game, you get to choose destination cards from a handful that are randomly drawn from the deck. These destination cards represent city connections that you need to fulfill, and can range from short connections like the Denver-Chicago line, or long ones like the Seattle-Houston line. Successfully connecting the cities on a destination card using only your own tracks will award you bonus points at the end of the game. A short line might net you an extra 5 points, while a transcontinental line could give you 15 or more points. At any time during the game, you can use an action to draw more destination cards. There is a drawback to these destination cards though: if you fail to connect the cities on your card, you lose the card's bonus points instead of gaining it! Since every player will be trying to fulfill their destination card routes and will be crisscrossing the map with their tracks, it is very easy to have someone else block your connection and prevent you from fulfilling your destination card. The game therefore boils down to a race to connect the more popular central lines, while figuring out what connections your opponents are trying to make, and hopefully block them. Once the game ends (which happens when any player nearly runs out of train car tokens), destination cards (both fulfilled and unfulfilled) are revealed and victory points are tallied. The game is a simple and fun game that is easily taught and can be finished in under an hour. As mentioned previously, it is a great gateway game that introduces new players to the concept of the German-style strategy board game. It is also an exciting and competitive game as players race to connect cities and block their opponents. Ticket To Ride is ideal for you if you are new to strategy board games or prefer games that are fun yet do not require too much strategizing or planning.